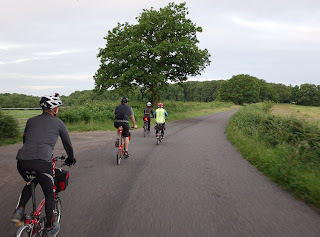 The London to Brighton ride is always a really good adventure but far too many people experience the joys of this tried and tested route via the many famous charity rides. These are so popular that quite literally thousands turn up, resulting in trying to ascend the famous Ditchling Beacon is all but impossible, through shear weight of numbers. In my opinion the only way to get the most out of this route is to do the entire thing by night. Friday was such a night. The meet point was the tried and tested Hyde Park Corner which was the location for many a Friday night ride to the coast. 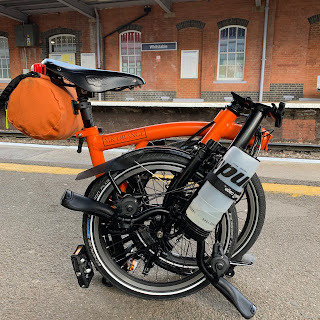 For once I decided to travel by tube and my Brompton. Now believe me this is something I rarely do as I not a fan of the tube at the best of times. Getting to a tube station late at night was rather strange as the time of night meant that tubes going into London were all but empty, while those on the other side of the platform were packed to the rafters. Still, the closer I got to central London the busier it became. I had to endure people whose teenage years were distant memories taking an endless stream of selfies, wearing clothes that were at least two sizes too tight for them. Arriving at Hyde Park Corner at about 23:30 I had a few minutes to spare before the troops arrived so I opted to take a few photos of the surrounding area. A group of tourists caught my eye as they silently walked arm in arm through Wellington Arch and beyond. Seemed like a strange way to pass the evening but then many might find it strange to spend the night cycling from Hyde Park Corner to Brighton. We're off to see the wizard? Soon the other participants in this adventure started to arrive - David, Anne, Jenny, Tony, Zoom Zoom and Harry from the excellent Phoenix Cycles (link below). In addition to working at Phoenix Cycles, Harry has also had an association with Brompton and was therefore in hot demand. No sooner had Harry said hello he was tinkering with someones bicycle. Our route for the first 20 or so miles was familiar territory and brought back happy memories of many a Friday night ride to the coast. As we were a much smaller group we stopped to regroup less frequently but still had the odd rest at tried and tested locations. Lonesome Lane brought back lots of memories and as we rode off down it I thought back to that nervous first overnight ride to Brighton. How far I have come since then! Our halfway stop - Gatwick Airport - came rather quickly I thought and this allowed us the sanctuary of warmth, refreshment and the famously well equipped toilets. Once inside Gatwick we passed lots of people in various states of sleep sitting, lying, propped up or leaning against each other. It reminded me of the Christmas Lights ride where we stop for refreshments at St Pancras Station in London. Commandeering a few seats in a coffee establishment we regrouped before heading out into the early morning after spending about an hour within Gatwick. At about 04:00 we emerged and there were signs of dawn fast approaching, although it might have already got there of course. Again a few extra layers were needed in order to keep the cold out for a few miles and again they were swiftly discarded when one had warmed up sufficiently. 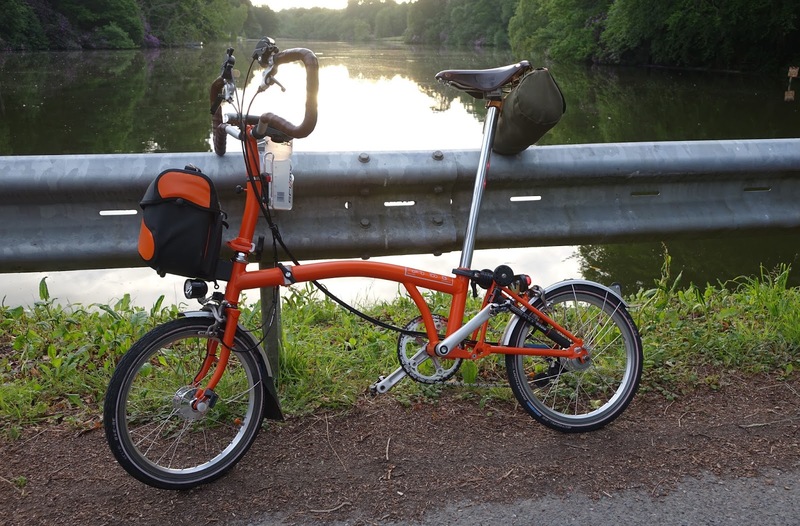 Harry opted to do the ride on an orange single speed S-type. It was a good looking bike. Harry's ascent of hills was astonishing. His speed was brisk and out of the saddle he made things look easy as he powered off into the distance. 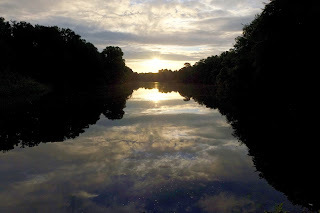 Stopping at a lake the sun was gently rising, casting beautiful reflections in the still, crystal clear water. Of course this was the inducement for almost all of us to prop our beloved Brompton bicycles in the centre frame of said scene and take lots of photos of it - with a nice landscape behind providing a bonus. There is something about Brompton owners and their fondness of taking pictures of their bikes. The Brompton website has a whole area dedicated to just this. Look close enough and you will find a few photos i have submitted! As you will see from the ride data recorded by my Garmin 810 the ride was by no means flat. This was a massive bonus as for me hills are something that make a ride. At the top of the hill we would wait for all to make it up, provide some rest time before heading off in the pursuit of even more. 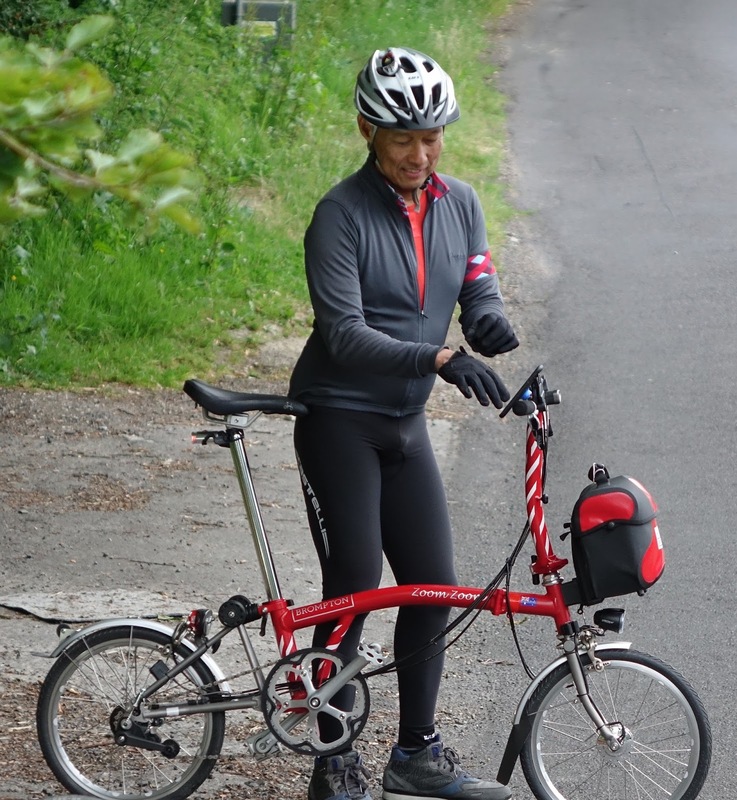 The most stylish Brompton rider? In the distance were some formidable looking hills and somewhere out there was Devil's Dyke. Having not ticked this famous climb off I was rather keen to see how I would fair. Devil's Dyke is almost 2 miles long with a climb of over 450 feet. At points it has a steep gradient. The name does conjure up horrid images but as I set off I didn't think things were too bad. It certainly became quite steep, with more than a few false summits but having done this many times before David and Anne warned us of this and where we would expect to see the end. The views as I made my ascent were stunning and David was right about the views being better than cycling up Ditchling Beacon. Harry was off into the distance, closely followed by David. By the time I saw them come into view resting on a grassy bank I knew that Devil's Dyke had well and truly been ticked off. The others in the group soon came into view and we had done it. At the top was the 'Dyke Golf Club' and some stunning views. in the picture below you can just make out the sea on the horizon. When Zoom Zoom arrived the look on his face was one of someone who had become quite taken with night rides to the coast. The next few miles were more or less downhill and in next to no time we were cycling along the sea front. My ticket was for the 08:49 train to Victoria so I said my goodbyes to the others who were on a slightly later train. As my train pulled out of Brighton Station I could not help but think back the ride we had all just completed. It was a particularly good route and I almost instantly wanted to book a date in my diary to do it all again. I cannot really say why but there is something about a ride of this nature. It is possibly why Friday Night Rides to the Coast which ran over a nine year period attracted well over 50 riders each time. In less than two weeks I will embark on the Dunwich Dynamo. This is a 100+ mile ride totally unsupported and again at night. I do feel that completing a few nocturnal rides is very important preparation for the Dynamo. I was also rather happy that after completing over 60 hilly miles my legs felt as if they could have done a great deal more. Thanks to all my fellow riders and yet again special thanks to David for another well organised ride. The map and ride data can be viewed via the link below as can a link to Phoenix Cycles. Another great tour you done, Mr. O.
I like the touring feel of this event.